Unfortunately, ACL injuries have become a common injury in sports, even with the increased training and preventative care. Most athletes who suffer a knee injury miss a substantial amount of their respective season, and may be lost for the year entirely. Parkview’s Autry Acord is not most athletes. The Viking senior standout recently did the unthinkable when he returned just three weeks after tearing the ACL in his left knee and setting a school record for points in a game when he dropped 46 in a 73-66 win over Ozark on Jan. 6. Coming off a 1st-Team All-Ozark Conference season a year ago, Acord and Parkview entered this season with high expectations. The Vikings faced a daunting pre-conference schedule that included the Missouri Basketball Coaches Association Hall of Fame Classic in early December, the Neosho Holiday Tournament, and the Bass Pro Tournament of Champions last weekend. Acord had an MRI, which revealed that he had “shredded” his left ACL. His Parkview career had seemingly come to a cruel and premature end. However, in an ironic twist, Acord had torn the ligament so severely that the doctor did not believe that he could cause any more damage to the ligament. Acord sat out the Vikings’ next game, a 50-39 loss to state-ranked McCluer North at the Route 66 Shootout at Waynesville on Dec. 19. Parkview then got 10 days off for Christmas before playing in the Neosho Holiday Tournament Dec. 29-31. In the meantime, Acord showed his doctor tape of him making cuts and other things he was able to do on his injured knee. Acord’s doctor, who said that usually people are not even able to walk with a similar injury, reiterated that he did not believe Acord could damage the knee any further. He was cleared to return to the court. Acord also consulted with his surgeon, who also said he could play on it if he wanted to, but to schedule a surgery as soon as he was done playing. It was an easy decision for the senior. Acord missed the first game of the Neosho tourney, a win over West Memphis (Ark. ), before scoring 35 points in a 71-66 overtime win over Memphis (Tenn.) Sheffield on Dec. 30. Just in case the magnitude of the previous sentence did not register, Acord scored 35 points in his first game back from shredding his ACL! Acord added 13 points the following night in a loss to St. Joseph’s Lafayette. He then got a week to rest his ailing knee, which he admitted was “killing” him in the Lafayette game. Parkview next took the court on Jan. 6 at home against Ozark, which was fresh off a Blue & Gold Tournament Gold Division championship. Acord was on fire from the start, and hit 11-of-12 shots from the field and 17-of-20 free throws in scoring 46 points, which is the most points ever scored in a game in the storied history of the Parkview program. The total eclipsed the previous best of 44 points, set by former star Erik Durham on Jan. 15, 2013. Unfortunately, Acord hurt the knee again in the Ozark game celebrating one of his many made shots. He sat out the Vikings’ 64-47 win over Camdenton on Jan. 9 in the Ozark Conference opener. Acord had one main goal in mind: play in the prestigious Bass Pro Tournament of Champions Jan. 15-17. Parkview would open the TOC against Paul VI out of Fairfax, Vir., a team which had won the 2013 Bass Pro Tournament of Champions and which entered this season ranked nationally by multiple media outlets. The Panthers featured multiple Division I recruits, including Syracuse commit Franklin Howard. 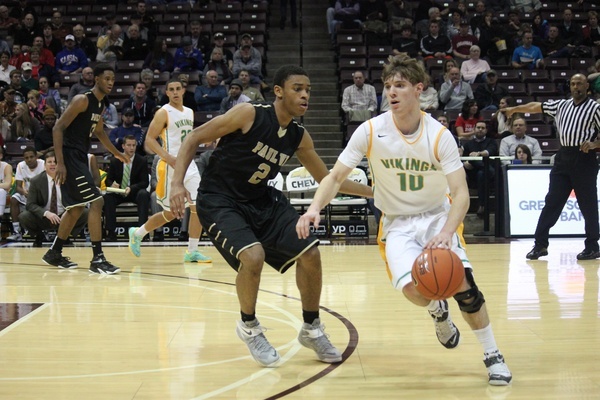 Acord started for the Vikings and played his heart out against the smothering Panther pressure. Parkview lost the game 65-34 to Paul VI. Acord finished with just four points (20 points under his average), but will cherish the experience forever. Acord sat out the Vikings’ second TOC game, a loss to Chino Hills (Cal. ), before returning to score four points in a loss to Waynesville on Saturday. In addition to being game-to-game, Acord has had to adjust to his regular skill set being diminished due to the injury. Acord will learn tomorrow whether or not his Parkview career will continue, or whether he has played his last game for the Vikings. Acord, who hopes to play collegiately next year and is looking at a handful of schools, will lace ‘em up without hesitation if given the green light. Regardless, Acord has left his mark on the Parkview program, certainly in the record book, but also with his relentless mental toughness, determination and courage.